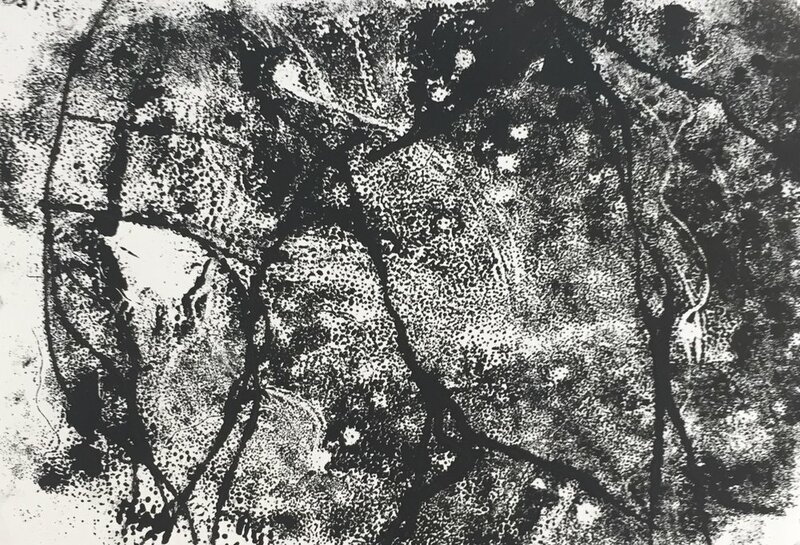 Another monoprint inspired by the fractured surfaces of car parks here in Christchurch , New Zealand. Two layers of cracking interact, and spread across the surface. And yet the surface holds, strong enough to move across towards a different future. 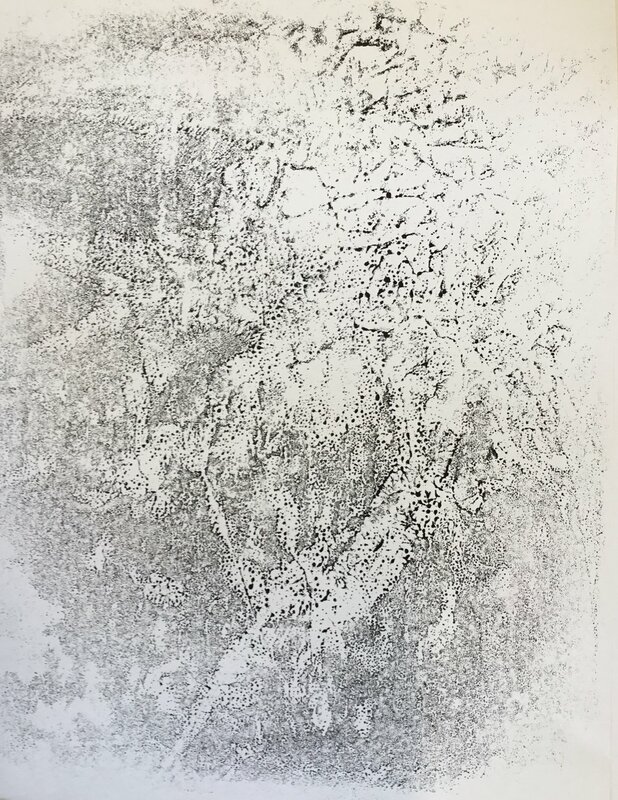 This print, from the SURface project, has at least three layers, printing and overprinting. Sometimes I see paths that lead in and out of the darkness. Sometimes it seems as if a tall tree reaches into the sky. There are horizons and falling shapes, light and darkness beckoning. And sometimes it’s just lines going nowhere and forms without edges. And then strong but tiny lines show up in the far distance.. In that moment. 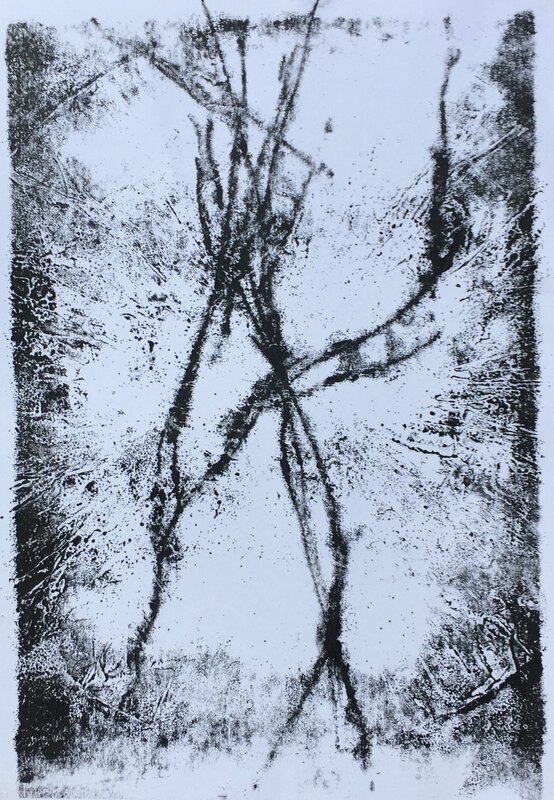 Monoprint. £150 from the shop. The rolling of grief across days. I took some steps back from the artwork, allowed space and more days. And when I came back, there were the roses. Dead and damaged roses appropriated for print-making. Wistful bouquets for the grief-stricken. 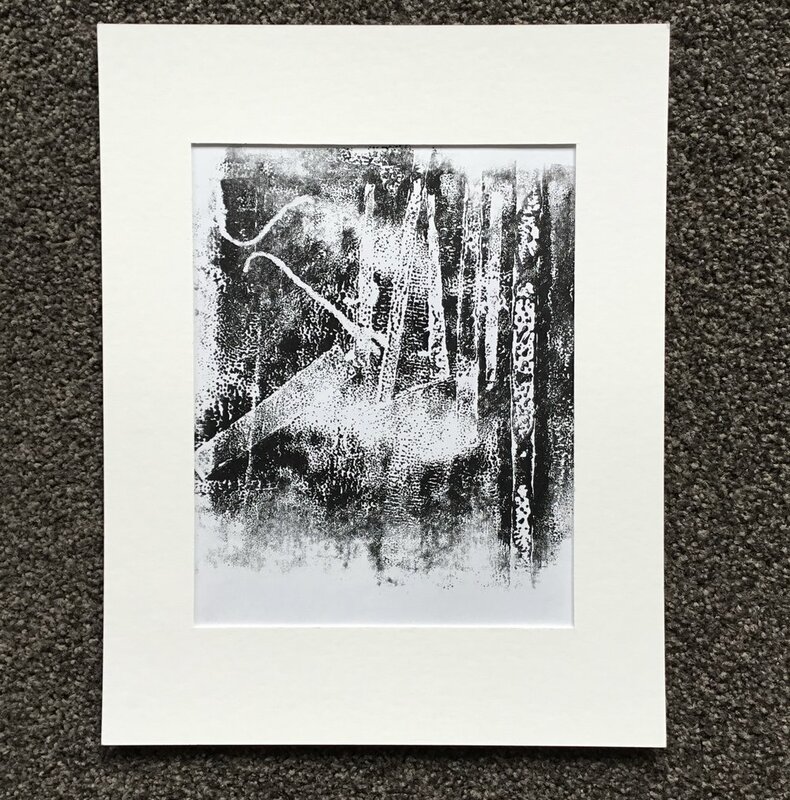 Today’s studio time was spent composing - using card mounts to create a composition within a frame. 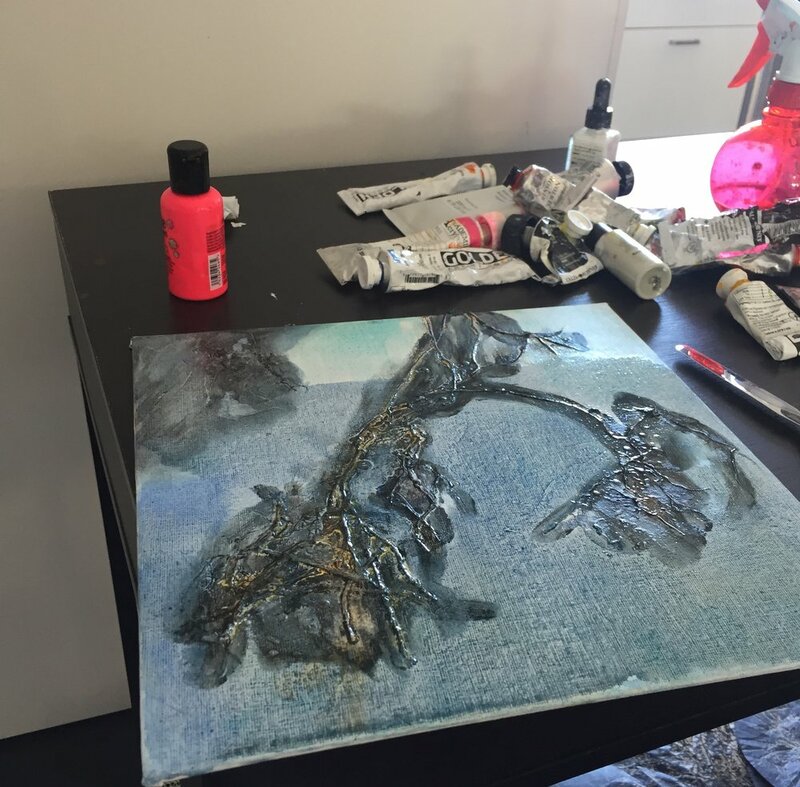 I love exploring what happens when wet paint spreads across a surface. Today I was working on this small canvas panel. And sometimes… a visit to the gallery doesn’t work, and you’re better off in the soft play area in the foyer! It is hard work taking toddlers to galleries. At that age, they resist being corralled and held back, while still too young to imagine how their movements might affect other people. Instead, the adult has to do this empathy work while diverting the child to less noisy or disturbing activities. Naya at 21 months enjoyed walking on the beautiful wooden floor of Christchurch Art Gallery and being in the wonderful starry lift. What spoiled our visit was a warning from an over-cautious attendant not to touch anything, and being followed to check we behaved ourselves – I would like to have been trusted not to let her cause upset or damage. We then retired to the soft play area, where she made towers of bricks. It was good fun but it was placed far from any artworks, and we could have been in a supermarket. How about a time in the week when little people are especially welcomed into the gallery with their responsible adult, who is also welcomed and given suggestions for how to direct the child’s attention and talk about the art? Other visiting adults would know what to expect during that time; some might even enjoy sharing the pleasure and delight of children being excited by art. During this time slot, toddlers could move around in their own way, fast or slow – having just mastered walking, they are still intrigued by the sound of their shoes on hard floors and excited by the wide open spaces of public galleries. Some artworks might be chosen each week for special looking, with some kind of steps and little viewing platform so that toddlers can get to see the paintings at their eye-level and fully experience them. Postcards of these ‘paintings of the week’ could be provided for children to take home and continue looking at. The lovely soft play area could be positioned inside a gallery so that there’s more chance of something ‘catching the eye’ and being talked about. Less valuable, but still interesting, paintings might be hung in the café (as is done in the Friends’ Room in the Royal Academy, London), and in educational spaces where toddlers come for activities organised by outside groups. Visual art is for looking at, for everyone to look at, however small they are. Robin was 4 years old when she visited an exhibition of my paintings in the Freie Universität Berlin. 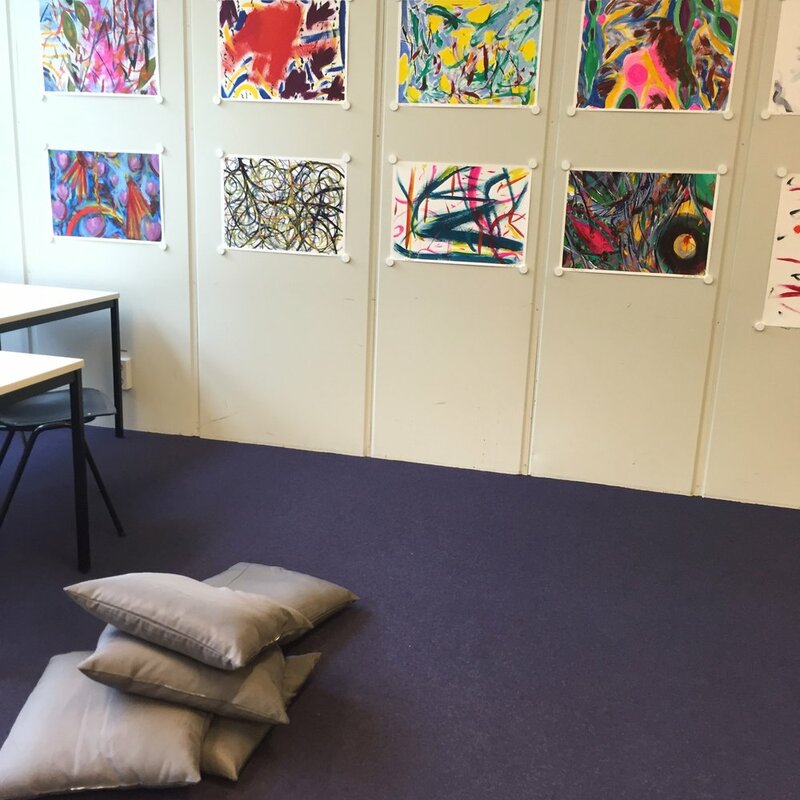 I had tried to make the experience of looking at paintings as comfortable and relaxing as possible, with cushions on the floor and chairs to sit in. I can see that she looked at the colours, shapes and composition of my painting. More exciting than that, it feels as if she also responded to the emotions expressed in it. Lighter. 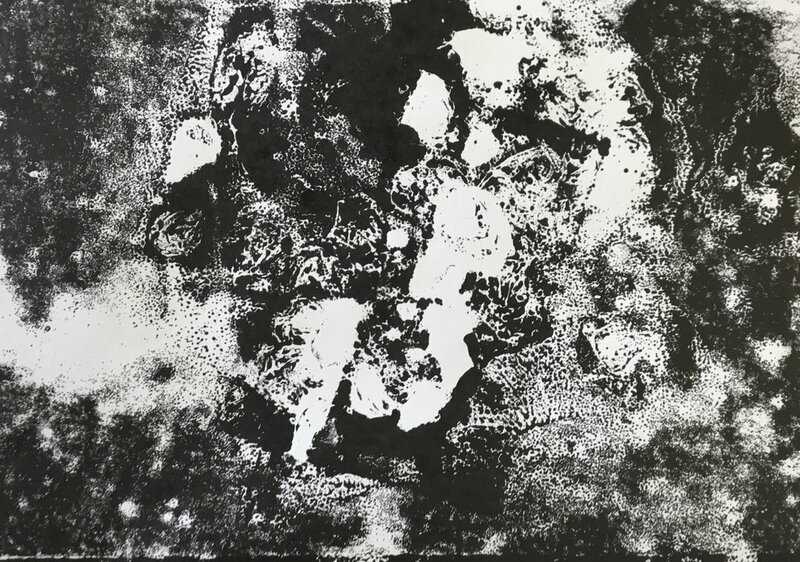 Acrylic on paper, Lynne Cameron, 2016. 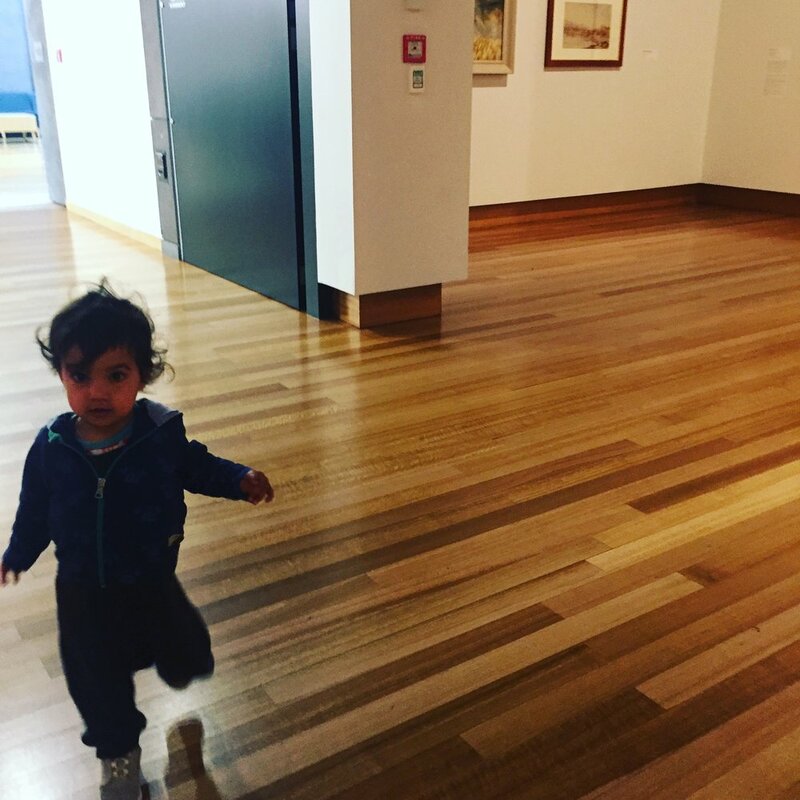 Our first visit to Christchurch Art Gallery, when Naya was 15 months old, was a delight. She toddled around the almost empty gallery, enjoying the wooden floor under her feet. Every now and then, she’d stop and point at a painting, saying “da”. I’d take this as a prompt to lift her up to see the painting at her eye level and start ‘discussing’ it with her. We did this 5 or 6 times on that visit – that was enough to make the visit a pleasure to be repeated, with both of us enjoying our interaction. I chose the gallery but Naya then wandered at her own speed. As adults we find some pictures more interesting than others, and there’s no rule that says we have to look at each in turn. 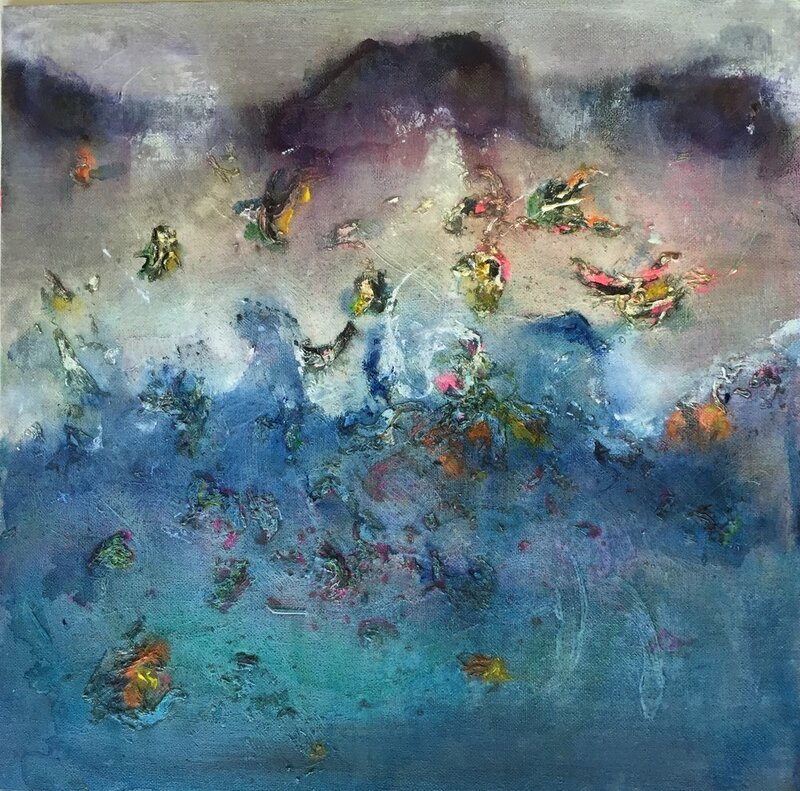 It is the adult’s job is to notice when a particular painting catches the child’s eye, and then follow their interest, going deeper through talking. By lifting Naya up from the floor, I was doing two important things. First, her eye level came to middle of the painting so she could look at the whole of it as the artist intended. If she had looked up from the floor, she would have seen a distorted version – try sitting on the floor and looking up at one of the pictures on the walls in your house to get a toddler’s-eye view. Second, by gently holding her and talking quietly, I was supporting her attention and her looking, for longer than she could have maintained it herself. Can you see the ball in the picture? That picture is bigger than you, isn’t it? This started me thinking more about why we take children into art galleries and what we expect them to get from their experience. These questions lead the children to think about their emotional response, to look for something they recognise, to name and label, to see paintings as objects. While any of these might be fun or interesting, they could be asked in the shopping mall or playground. How do we help children look more deeply at artworks? 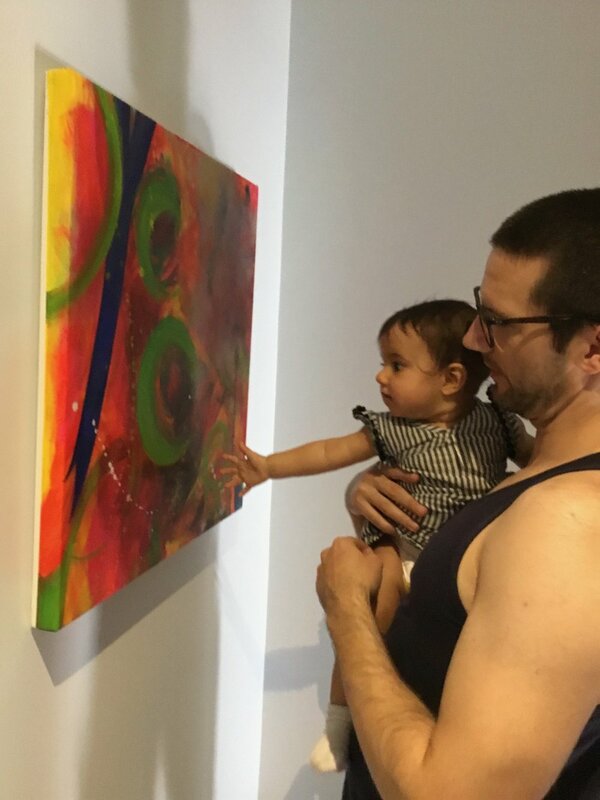 Naya, aged 9 months, with her father, looking at Here they come, acrylic on canvas, Lynne Cameron. Naya is now 21 months and has been looking at this painting of mine since she was a tiny baby. She passes it on the stairs and greets in the morning, says good night to it on the way to bed. When I carry her, we stop by it, and I talk about it, trying to extend her looking at the abstract painting in terms of colour / shape and movement / light and dark – and how it makes us feel. Do you like that green circle? Look, here’s another green circle. A little one. And here’s a big big one, going off the edge. And what’s in the middle? Yes, it’s blue. Where’s the pink? The pink goes all the way to the edge… into that dark shadow. I like this white dotty part Which bit do you like? 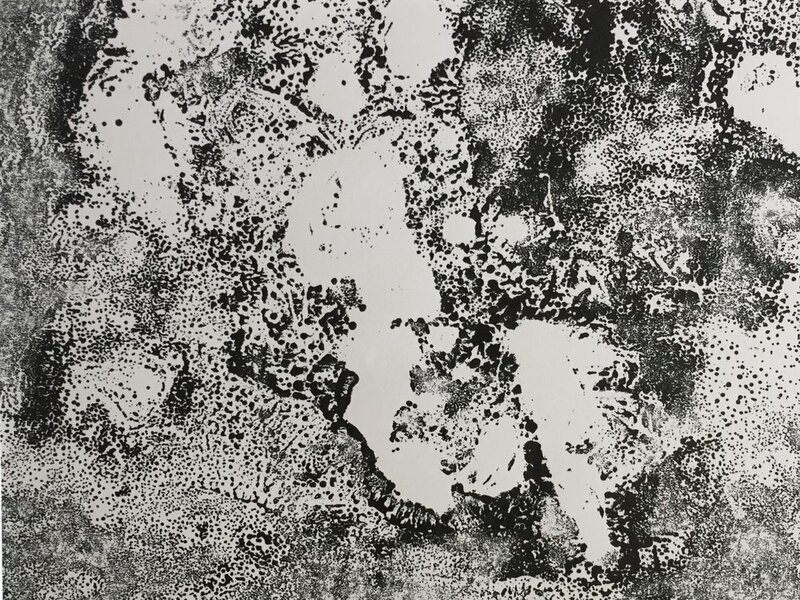 The aim is for Naya to experience a combination of interest, growing familiarity, and deepening attention that is a great start to her looking at art.